One of the longest and most expensive political wars in recent Philadelphia history has come to an end. On Thursday, City Council voted 13-4 to enact a tax on sugary drinks and diet sodas. The American Beverage Association has spent nearly $5 million since March to flood the airwaves with anti-soda tax ads. But even that doesn’t capture the full scope of the soda industry group’s spending: It worked diligently to fight off a soda tax since 2010 — when former Mayor Michael Nutter first floated the idea — by lobbying Council members and donating hundreds of thousands of dollars to political campaigns. This year, though, the soda lobby’s deep pockets weren’t enough to kill Mayor Jim Kenney’s proposed tax. In the end, only Democrat Maria Quiñones-Sánchez and Republicans David Oh, Brian O’Neill and Al Taubenberger voted against the 1.5-cents-per-ounce tax on Thursday. This is a career-defining victory for Kenney. The mayor took on one of the most powerful lobbies in the United States and won, which has boosted his national profile and proven that he has a critical number of allies on City Council. The fact that the soda tax will help pay for the renovation of the city’s parks, libraries and recreation centers — and that the administration will determine how to divvy up that spending with district Council members — means that Kenney could potentially have favors to give out for years to come. But how much political capital has the mayor spent in the fight over the soda tax? We may soon find out: District Council 33’s labor contract expires on June 30th. The city’s blue-collar union was one of the many groups that supported the mayor’s soda tax, which could make it more difficult for him to negotiate with it. This has been a long fight for expanded pre-K advocates, including Philadelphia’s Public Citizens for Children and Youth, the William Penn Foundation, the city’s teachers’ union, Councilwoman Helen Gym and many others. Those groups and their counterparts around the country have argued for years that children who attend pre-K are more likely to graduate high school and earn higher incomes as adults, and less likely to get caught up in the criminal justice system. 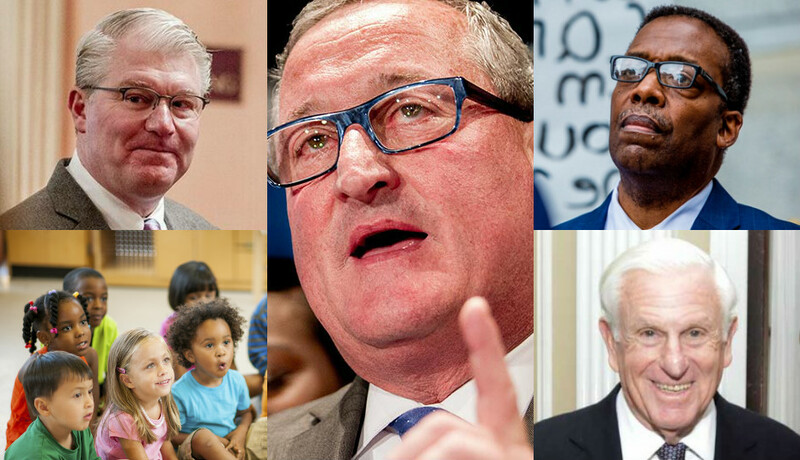 The soda tax will pay for 6,500 additional kids to go to pre-K annually, according to the Kenney administration. Now the question is whether these activists can push the city to establish universal pre-K across Philadelphia. Kenney did not sell the soda tax as a way to improve the health of Philadelphians. Instead, he said it was all about raising money for expanded pre-K and other programs. But no matter how it was advertised, the soda tax is likely to reduce the consumption of sugary drinks around the city, which is expected to lower obesity rates. The U.S. Centers for Disease Control and Prevention found that regular soda consumption is correlated with obesity, and other cities’ experimentation with soda taxes has suggested that the additional cost added by levies reduces consumption. That’s a win for a city that has one of the highest obesity rates in the country. While he was mayor of New York City, Bloomberg fought hard against Big Soda. He proposed a ban on large soft drinks and hired soda fighter Thomas Farley to be his health commissioner. Bloomberg waded into Philadelphia’s fight over the soda tax earlier this year, donating an undisclosed amount of money to Philadelphians for a Fair Future, a coalition of civic and labor organizations lobbying for Kenney’s tax. That helped pay for the group’s pro-soda tax ad campaign, which enabled it to counter the American Beverage Association’s millions of dollars’ worth of commercials. Oh, and did we mention that Farley is now Kenney’s health commissioner? Nutter tried, and failed, to pass a soda tax in 2010 and 2011. At the time, it was seen as a stunning defeat. But in the wake of Kenney’s victory, it will likely be viewed much differently. Already, public health advocates are arguing that Nutter helped set the stage for a sugary drinks tax. Indeed, he came close to getting it approved himself — he had a majority of Council members on his side for a brief period time before they succumbed to soda lobbyists. For years, the advocacy group has been sounding the alarm about the fact that Philadelphia spends less money on parks than many other big cities. The Parks Alliance has packed repeatedly City Council chambers, released regular reports, and pushed for journalists to write about the issue. Today, its work paid off: The soda tax will help fund a $300 million repair of the city’s parks, rec centers and libraries. The beverage industry has been fighting the soda tax tooth-and-nail since Nutter first proposed it in 2010. The American Beverage Association poured boatloads of cash into political campaigns and deployed a stream of lobbyists to City hall, twice helping to convince Council to vote against the tax, and once defeating a proposal before it was even introduced. But now it has finally lost. One of the biggest cities in the U.S. has adopted a soda tax, which could have a domino effect and, potentially, push Big Soda into Big Tobacco territory. Smoking bans began at the city and state level, and spread across the country. Scholars believe the same thing could happen to soda taxes. We could lump Harold Honickman in with the rest of the soda industry, but the bottling mogul’s individual efforts to kill Philadelphia’s soda tax earn him a spot of his own on this list. Honickman has been among the most prolific campaign donors to members of City Council, and he was present at most of the Council meetings on the soda tax proposal, regularly popping in and out of meetings with Council President Darrell Clarke. Honickman wanted so badly to kill the tax that, according to a spokesman, he offered to raise money to help fund the first year of expanded pre-K in exchange for the city delaying the soda tax debate. The Kenney administration said Honickman offered to pay between $7 million and $9 million himself, and raise money from others. The Teamsters, the union that represents soda industry workers, claimed during the heat of the soda tax battle that enacting a levy would kill 2,000 jobs in Philadelphia. Though it’s not at all clear that things will turn out that bad for the union, the passage of a soda tax does count as a political loss. The Teamsters have long been at odds with building trades leader John Dougherty over work at the Pennsylvania Convention Center, and the union endorsed State Sen. Anthony Williams for mayor last year. The passage of a soda tax reinforces the Teamsters’ isolation from the political power center. The Council President made it clear throughout the last few months that he had no love for a tax on sugary drinks, and sources say he bargained for a lower rate than 1.5 cents per ounce in the hours before last week’s preliminary vote on the policy. Clarke had a tight grip on Council during the Nutter era, and the soda tax fight shows that his power then at least partly came from his ability to take advantage of the fact that Council members shared a common enemy in Nutter. Now, he has no such thing in Mayor Kenney. Whether Clarke will be able to build back his clout is one of the most interesting questions right now in Philadelphia politics. Council members considered a variety of alternative proposals to Kenney’s soda tax, but Councilwoman Blondell Reynolds Brown’s call for a 15-cent container tax seemed to pick up the most initial support. She said the tax would be less regressive than Kenney’s because it would hit a broader base of products — Perrier as well as Pepsi, she liked to say. The failure of her container tax to even get a vote puts Reynolds Brown in the “Losers” column here, but it wasn’t all bad for the veteran Councilwoman. She successfully got a tax credit encouraging merchants to sell healthy beverages included in the budget. And she’s been a vocal supporter of expanded pre-K, which will be funded by the soda tax. Councilwoman Maria Quiñones-Sánchez has a Coca-Cola bottling plant in her district, as well as many minority-owned bodegas that she says will be hurt by the soda tax. She was one of the leading opponents of the tax, coming out against it as early as May regardless of what the rate was. She fought against a sugary drinks tax when Nutter proposed it years ago as well. It was all for naught. Still, her position on the soda tax may have endeared her to Clarke, who has been a recent ally of Sánchez’s. If Clarke is able to rebuild his power in Council after this loss, that could benefit Sánchez in the years ahead.